After 12 hours of research, testing, and slurping to my heart’s content, we have concluded that Wang’s Katsuo Instant Udon is the best Korean udon in the US. The variety of instant udon noodle soups out there truly warmed my heart, but Katsuo udon’s flavors work harmoniously with each other and paired with their thick, pillowy noodles and you have a wonderfully comforting dish great for a cold night… or any night really. Wang’s Katsuo instant udon edged out Nongshim’s original instant udon due to its more complex flavor profile. A great level of saltiness, sweetness, and tanginess with none overpowering another and all coming together in the end. It brings an earthy undertone to it which adds to the comfort of the broth. The noodles were non-fried, thick, and fluffy so that each slurp felt like an adventure of its own. This instant udon noodle package comes with a liquid broth and some dried ingredients such as tempura flakes, but nothing that should throw you for a loop. Smart move since it really lets the broth and noodles shine. I can definitely eat this every day, regardless of the weather outside. The OG! I remember eating this (along with instant ramen noodles) as a little kid and it never disappoints. If I had to give them a title, Nongshim’s udon would be the jack of all trades of udon. It has it all — soft yet chewy noodles, a nice mellow broth with a hint of sweetness in every spoonful. I also really enjoyed the little narutos and tempura pieces that go in it as well. The reason I knocked this right below Katsuo is because the taste is slightly less hearty and I didn’t get the same level of sweetness as I did from Katuso (I don’t know… maybe my taste buds are dying out). Regardless, everything is so balanced and smooth it still hits the spot. What is Good Instant Udon? 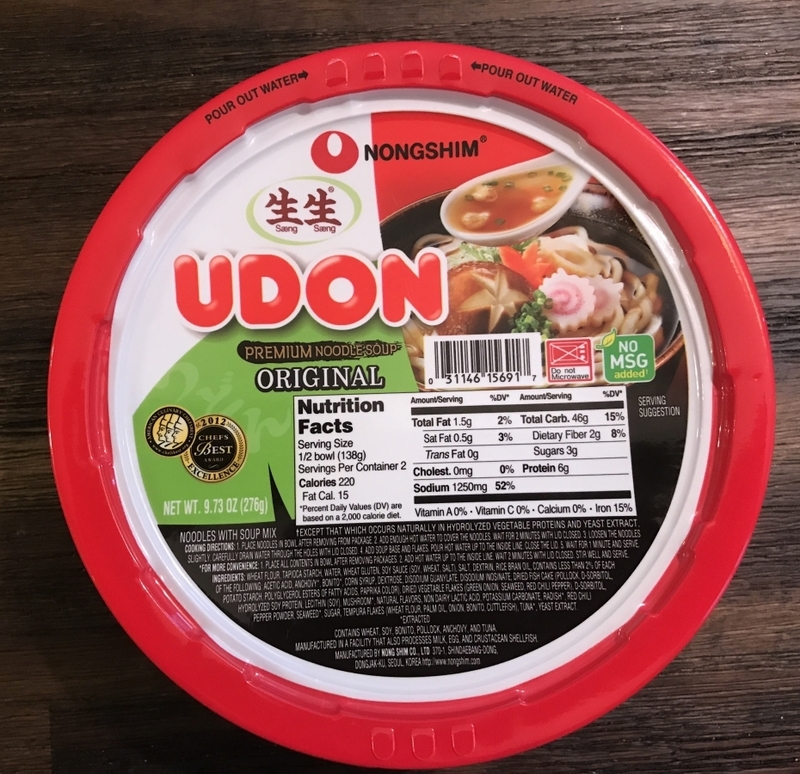 Although Nongshim advertised this as udon, it’s eerily reminiscent of the thin fried noodles that usually come in the standard pack of instant ramen. This automatically knocked it down a few pegs, udon is a specific kind of noodle, can’t fool me Nongshim. Unlike most other instant udon noodles the soup base comes in powder (instead of liquid) form. The broth is a little blander than the other tempura udon, but it rounds out pretty nicely and has a good little kick in the end. The extra ingredients are definitely the best characteristic of this udon and a slight notch ahead of most of the other brands tested. This instant noodle soup comes with thick pieces of fried tempura that add a slight fish cake flavor and soak up the broth’s flavor well. The extra textural contrast is a nice touch. 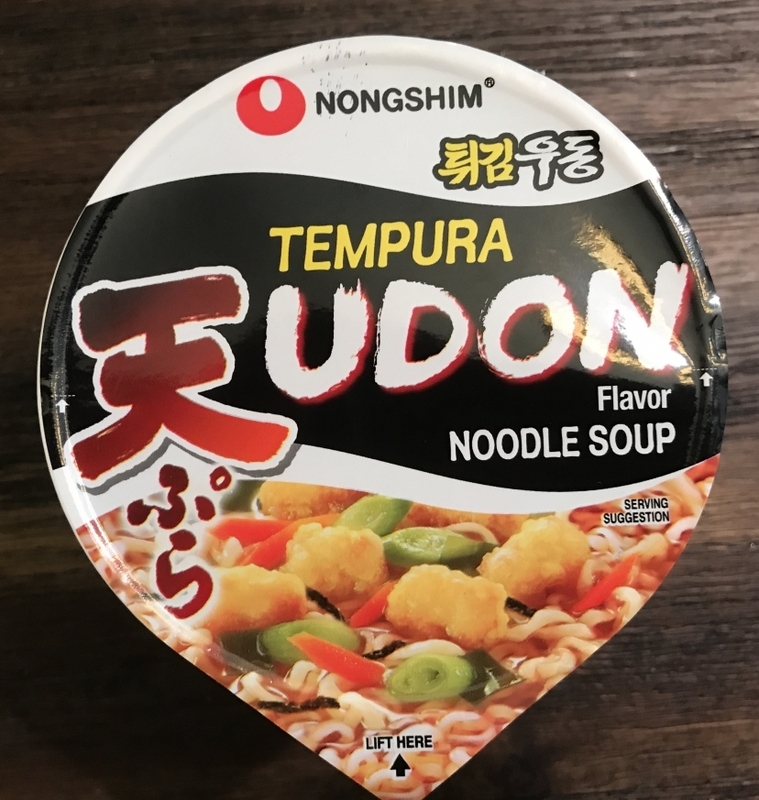 There are a couple parallels with Nongshim’s tempura udon here, the thin, deep fried, ultimately disappointing instant ramen noodles… that again are not what udon noodles texturally are. 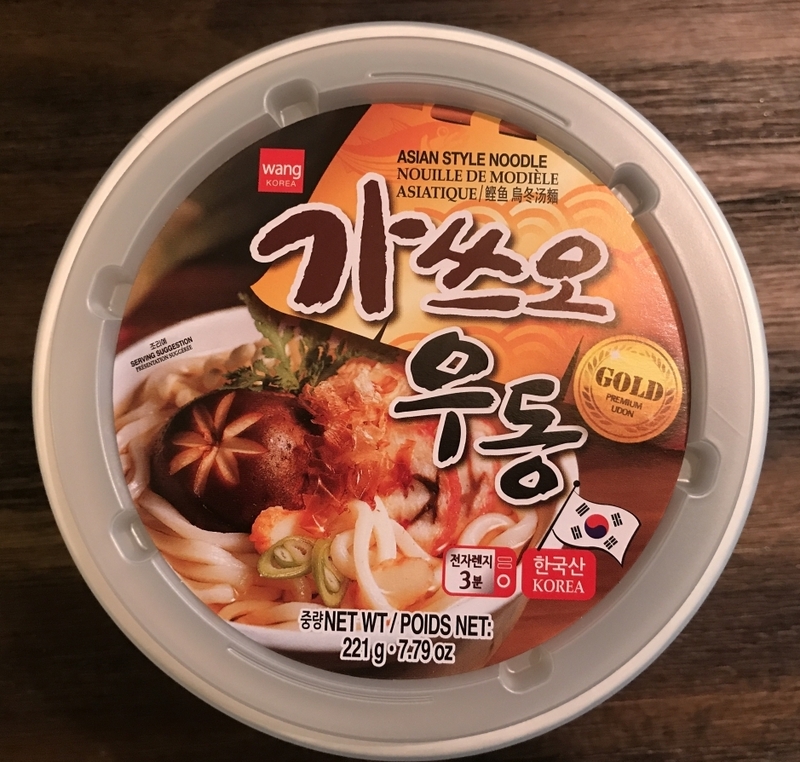 Paired with a powdered soup base while more flavorful and seasoned than Nongshim’s doesn’t bring the hint of sweetness I typically expect from udon noodle soup. Although advertised as tempura udon there was a marked difference in the tempura cakes compared to Nongshim’s… mainly in that there really weren’t any. This makes a little sense as they focus more on the ttigim (튀김) or fried part instead of tempura; either way, it did come with my favorite fish cake — naruto! Fun fact: the more famous Naruto’s name actually comes from narutomaki, a fish cake usually found in ramen. 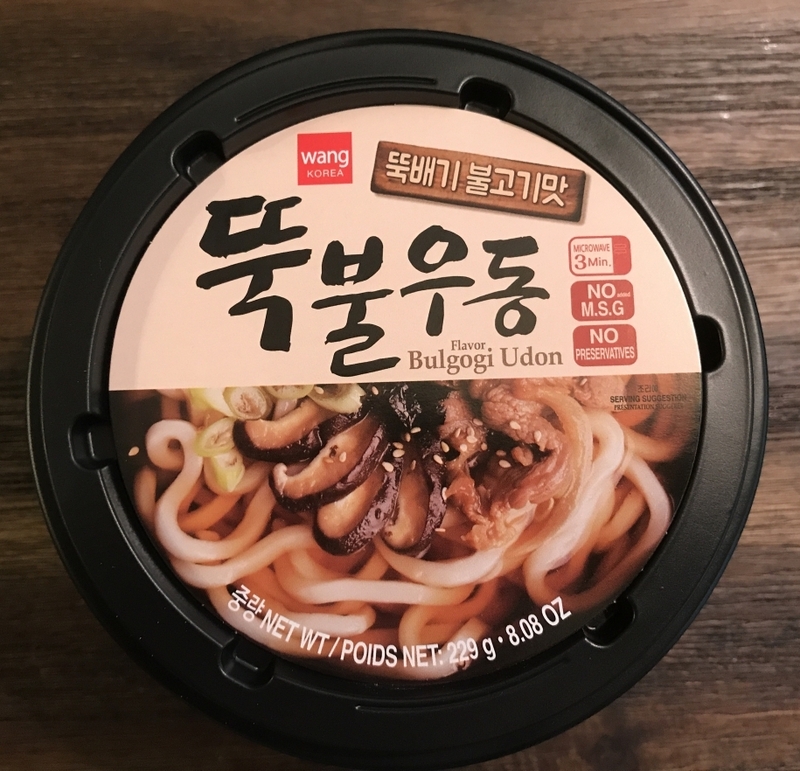 I was really excited to find this brand because honestly how can you resist mixing bulgogi and udon together? Bulgogi, which typically falls on the sweet side, should seem like a perfect fit with udon. However, I admit that I was naive in thinking that there would be some pieces of meat in there. The picture definitely fooled me! The packet comes with non-fried thick udon noodles, a liquid soup base, some dried ingredients, and sesame oil. While the noodles were on point, I didn’t quite understand the sesame oil. It doesn’t blend in very well with the broth and stands out as a flavor on its own. I’d skip out on it the next time. Also, the broth came out too sweet compared to other brands. You’ll definitely need some kimchi or something else sour to cut through the sweetness. The world of instant noodles is awesome. Instant noodles come in all shapes and sizes and flavors and can be filled with steaming hot broth or stir fried in extremely spicy paste. Next time just go through your local Asian grocery store and you’ll see endless versions of instant noodles such as instant ramen, pho, gomtang, mee goreng, jajangmyun, etc. As I mentioned before, instant noodles are college students’ and drunk friends’ lifeline. Their affordability and convenience has made it a college dorm staple and a fixture in pantry shelves around the world. 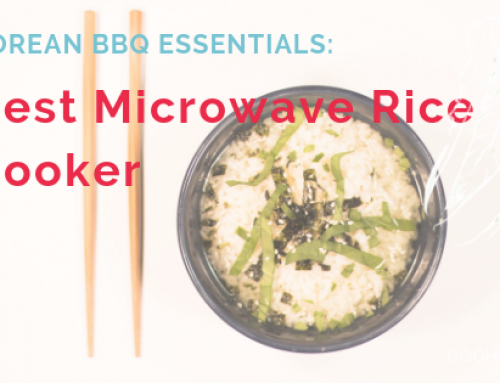 Ever since Momofuku Ando invented the instant noodle in 1958, it has become a global phenomenon with everyone putting their own twists and spins on the OG. As one of ramen’s brethren, udon (우동) originated in Japan and the style varies depending on the region. 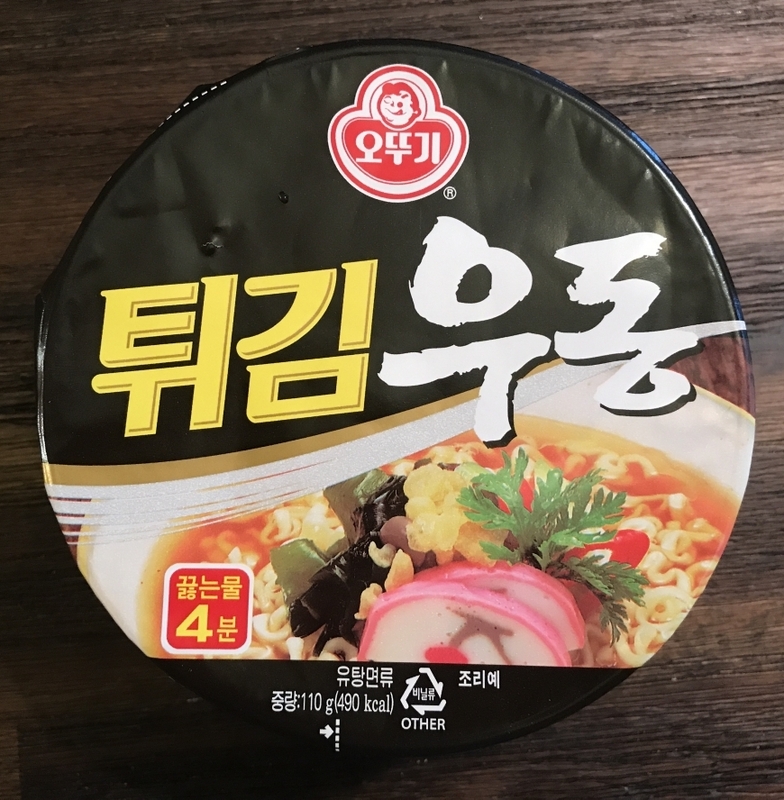 It’s not much of a surprise that Koreans started to make instant versions of this comforting dish. It doesn’t get as much hype in the U.S. as ramen but don’t let this fool you… it’s underrated in terms of taste and health (relatively). Udon refers to how the noodles are made — from wheat flour — and is usually much thicker, more pillowy, and softer than ramen noodles. Unlike most instant ramen noodles, udon noodles aren’t fried which results in a much lower calorie content, but a much more limited shelf-life. Udon also has a neutral taste making it extremely versatile and can be added to tons of different Korean flavored stews and soups (i.e. budae jjigae, kimchi jjigae, hot pot, etc.) or even broth-less such as yaki udon, which is one of my favorite dishes to make. Although there are tons of variations of udon, it is traditionally served in a hot, mildly sweet soy-sauce like broth and can have a range of ingredients such as shrimp tempura, vegetables, and fish cake (my favorite is white and pink swirly things called naruto). It’s great for any occasion, but perfect to eat piping hot when winter’s breath starts chilling the air. My expectations for good instant udon noodles aren’t as high as you would typically get at a restaurant, but the requisites are still pretty similar – a mildly sweet broth with thick, fluffy noodles. The extras are sometimes nice, but mostly I’m in it for the heart warming broth and noodles; I don’t want too much stuff in my way. Plus, I’m not sure how I would feel about seafood kept at room temperature for several weeks. When you only have a few components they all need to shine in their own right. The seasoning and flavors from the soup package paired with any extra toppings need to produce a vibrant and fortifying broth, while the noodles should soak up all that flavor whilst maintaining that chewiness that tells you you’re eating something. The noodles should be “al dente” and maintain its structure throughout your entire meal. You don’t want noodles that immediately mush up like baby food. Flavor wise for this test we’re looking mainly at the depth/complexity of flavors in the broth. Something that isn’t overpowering, but flavors that subtly pop up in your mouth while not disrupting the balance. I’m not a food expert or a noodle connoisseur, but I’ve probably had over thousands of instant noodles in my lifetime. We also spend countless hours researching and testing the product to ensure a more objective basis of judgment. Simply though, I’m just here to give my honest opinion of a dish that is seriously underrated and I believe one of the next big food trends. Additionally, the purpose of this test isn’t to develop an individualized opinion of each udon, but to compare and contrast in the hopes that you can find what fits best for you. This test actually happened by random. As I was perusing through my local H-Mart I was surprised to see the instant noodle aisle filled with instant udon instead of ramen. After researching some of the most popular brands and companies, we chose five varieties of udon noodle soup, all coming in cup noodle form, and pitted them against each other. To qualify all the instant udon noodles needed to be from a Korean manufacturer, state udon in the title, and be cooked with broth. I cooked each udon per instructions and nothing was excluded from the package and no outside ingredients were added. The noodles were cooked at different times to ensure proper texture. I divided the test based on two basis — the broth and the noodle. 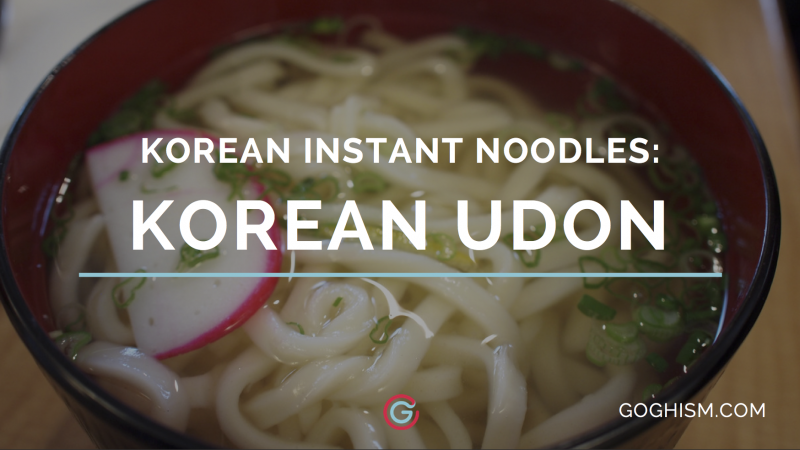 We will update this post with any other instant udon that we can’t resist to slurp down as well as any recommendations. In addition, we will continue to explore the world of instant noodles and the myriad of varieties out there. It’s a huge and deliciously expanding food scene and we are excited to have only scratched its surface. Instant noodle fans, rejoice! 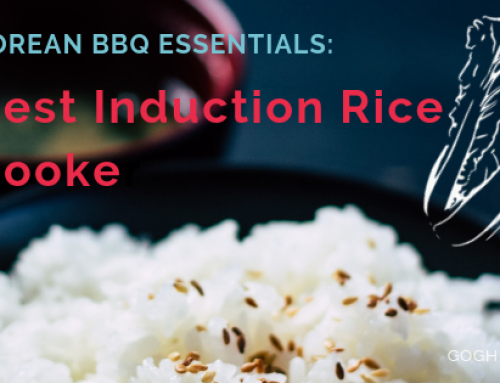 As the popularity of instant noodles trends up, plenty of variations continue to be created to fit all types of palates at an affordable price. Instant udon is no exception but in a universe where ramen is king, udon will surely sneak up on people. Its mild, sweet taste really hits the spot when I want to eat something that doesn’t feel too heavy. The noodles in my opinion really steal the show though as each bite has this wonderfully satisfying texture to it and the slurp-ability is second to none. As we continue to truly sit down and taste different Korean food (or at least Korean variations) while being a part of Goghism, it’s amazing to note the cultural influences and other nuances that goes in each cuisine. I’ve further grown to appreciate the tastes that can come out of any dish, regardless of whether it’s a $50 sushi course or a $2 instant noodle bowl. Hopefully in the near future as I continue to slow down and really taste food, I’ll be able to create dishes of my own that my wife won’t immediately refuse or criticize (she’s a pretty good cook btw). On second thought, give me a few more years.